For quite some time now, Mercedes has enjoyed nearly unrivaled sales in the factory all-wheel-drive and four-wheel-drive van market. In fact, they have been so successful in the space that they have occasionally had trouble keeping up with demand, a problem Ford hopes to help them remedy by throwing their hat into the ring. 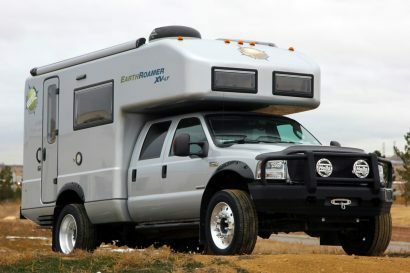 That’s right, after recognizing the huge interest in the vanlife and adventure scenes, the blue oval has finally announced that their next iteration of the Transit will have an all-wheel-drive option for customers looking to “seek out adventures.” This is obviously huge news, and will hopefully spur other manufacturers to follow suit, but before we start speculating, let’s look at what we know. 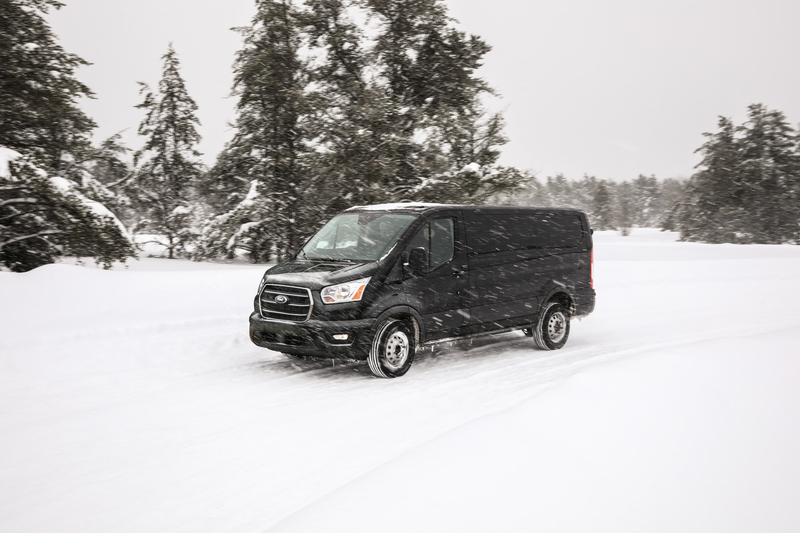 The Transit’s new “intelligent all-wheel-drive system” will come with four selectable drive modes to help compensate for various road conditions. 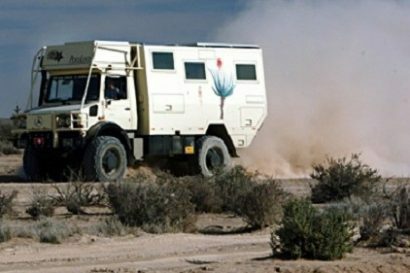 In normal mode, the van will constantly track and optimize the torque output to the wheels to prevent a loss of traction. Up to 100 percent of the engine’s power can be allocated to the front wheels under heavy acceleration, however, this will be rerouted as wheel slip occurs. 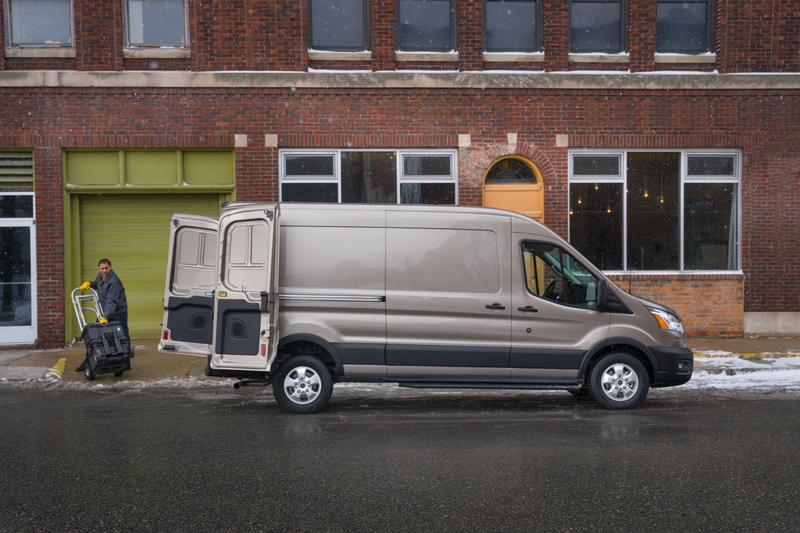 Off-pavement drivers will be able to select a mud or ruts mode which will likely give the van a more aggressive traction control profile and distribute power more evenly between the front and rear wheels. The fourth and final drive configuration is described as slippery mode, which sounds more than a little ridiculous if I’m honest. It’s how I would explain all-wheel drive to an elementary student, and I hope that upon release the dial says something like snow or ice, because I don’t think I could stomach turning my lifted off-road van to the slippery setting. Sheesh. 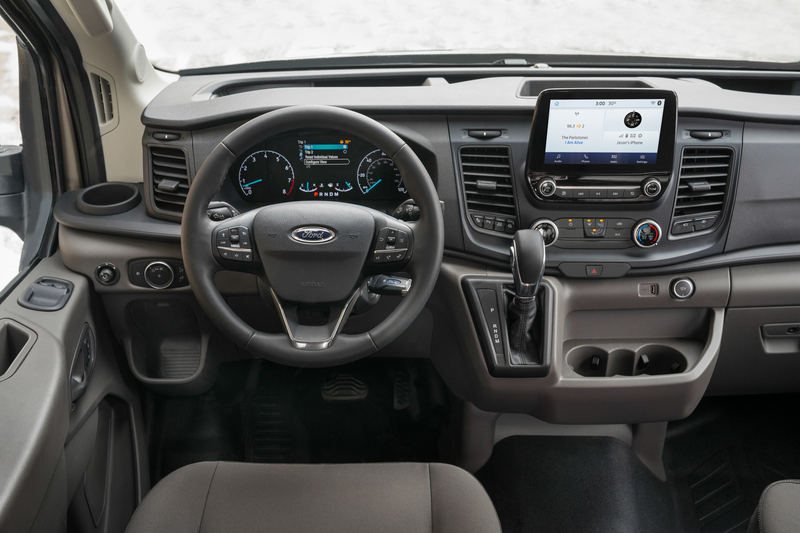 For those looking to build out the interior, you’ll be happy to know that the all-wheel-drive transit doesn’t lose any interior volume over the standard two-wheel-drive variant. Ray Eyles, Ford Transit’s chief program engineer, was quoted as saying that they “integrated Transit’s new all-wheel-drive system into the vehicle design early on to ensure it does not raise the load floor or seat height.” While they tout this in relation to the ease of entry and exit, we’re focused more on the retained interior height for standing and moving about in the cabin. Now for the bad news, at the end of the press release’s section on the all-wheel-drive system, there’s a pesky little sentence that states “All-wheel drive is available with gasoline powertrains.” Yup, despite the fact that Ford will be offering an all-new 2.0-liter EcoBlue® bi-turbo inline-4 cylinder diesel AND an all-wheel-drive system in the transit at the same time, you can’t have them together. That’s a little disappointing for the numerous customers who undoubtedly dreamed of the diesel’s fuel efficiency, but honestly, beggars can’t be choosers. We’re just excited to see an all-wheel-drive option at all. 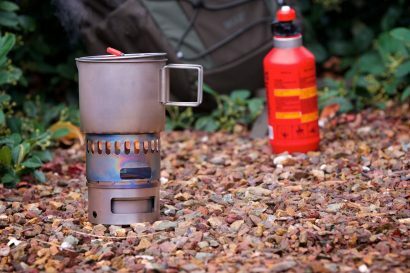 Buyers will be able to choose between two gas motors. The standard motor is an all-new, 3.5-liter PFDi V6 with port fuel and direct injection. The press release doesn’t say how much horsepower or torque this variant will be rated at, but we expect it will be similar to the 275 horsepower and 260 pound-feet of torque currently offered from the 3.7L Ti-VCT V6. That’s respectable to be sure, but you can also get the all-wheel-drive model with the proven 3.5-liter EcoBoost® with a much more respectable 310 horsepower and 400 pound-feet of torque. Both engines can be equipped with dual 250-amp alternators, and come standard with a new 10-speed automatic transmission. 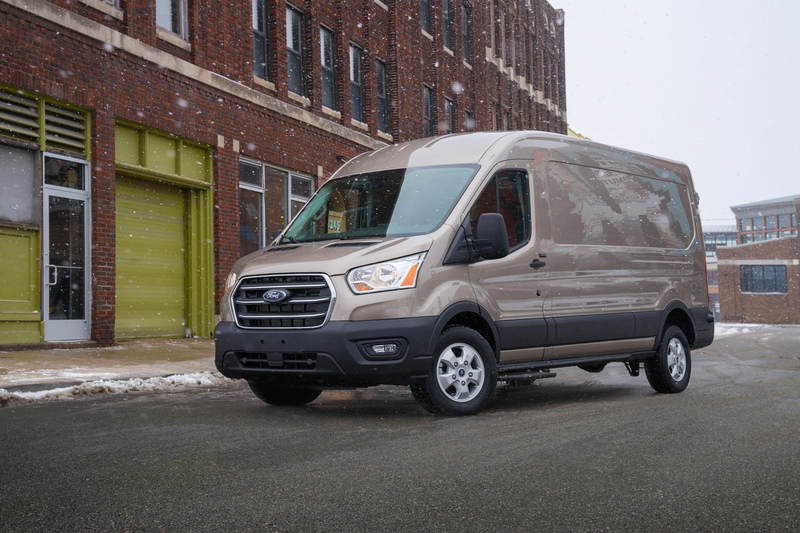 While Ford’s all-wheel-drive system will undoubtedly sway some buyers to their side, we can’t help but wonder if it will really be able to compete with the true four-wheel-drive Sprinters. No matter how you slice it, the Mercedes’ low and high range transfer cases are a distinct advantage, and that may be the determining factor for people who really want to get off the beaten path. Only time will tell though. 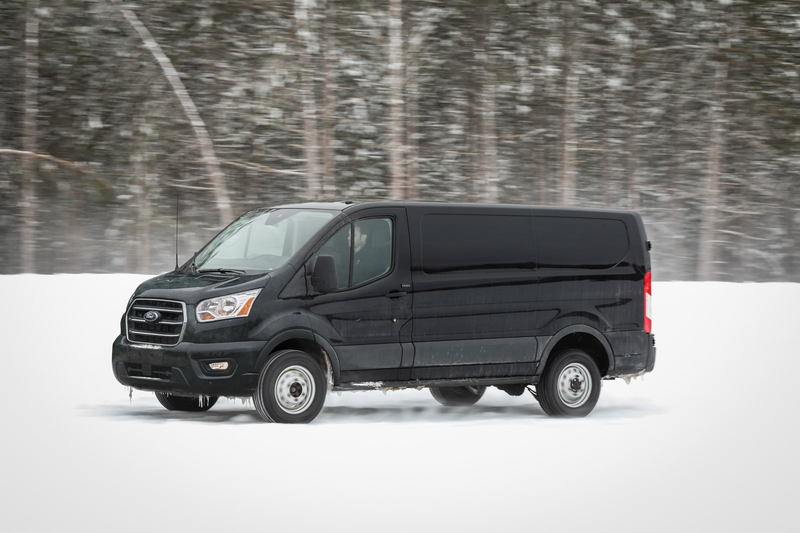 Just as Subaru has carved out their slice of the off-road and outdoor market, the all-wheel-drive Transit may do the same.